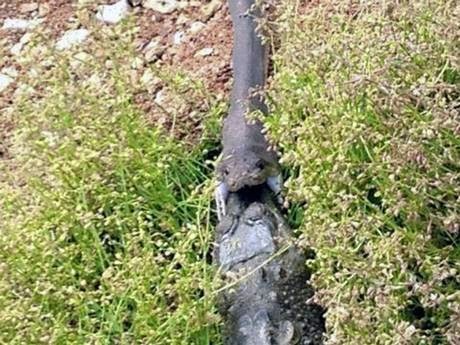 A five-hour battle between a snake and a crocodile, which ended with the 10ft python eating its vanquished opponent, has been caught on camera by stunned local residents in Queensland, Australia. The extraordinary bout testing the animals’ strength and endurance took place at Lake Moondarra, near Mount Isa, and was drew quite a crowd from people having breakfast nearby. According to Tiffany Corlis, a local author who captured the incident on her mobile phone camera, the snake coiled itself around the crocodile while both were in the water, but the smaller reptile was able to keep its head in the air and stay alive. Eventually the metre-long croc succumbed to exhaustion, and what some witnesses said may have been up to five hours of constriction, at which point it was dragged out onto dry land.